Design and build your own locomotive using our castings. Are you an experienced locomotive builder? Then you might decide to design and build your own locomotive using our castings. 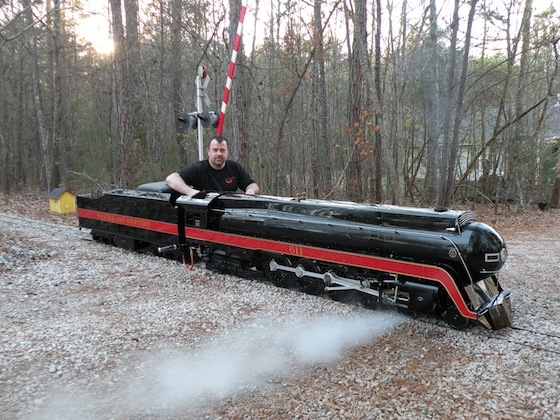 Experienced builders are successfully using our very versatile castings to build model locomotives with wheel arrangements other than those that we offer. The vast majority of our castings including drivers, cylinders, valve gear, trucks and more are individually available for scratch building and free lance construction. Experienced builders can very easily imagine a whole variety of different locomotives that could potentially be designed and built using our very versatile castings. The only limit on the potential possibilities is one's own imagination. The photos below shows just two of the many possible locomotives that customers could design and build using our castings. The builder of these two locomotives used our USRA 4-6-2 Heavy Pacific cylinder casting set and the long frame version of our Baker valve gear casting set as the starting point for designing and building both his Norfolk & Western J 4-8-4 and his Norfolk & Western A 2-6-6-4 locomotives. You, too, can design and build your favorite locomotive around our castings! Which favorite locomotive of yours can you envision designing and building for yourself using our castings?